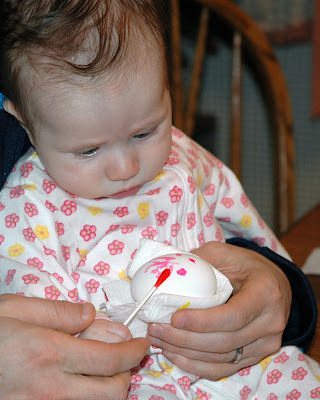 Easter with the Furrs started out the night before with the traditional egg painting. Although she needed a little help from daddy, it can be clearly seen that Ava was intent on doing a good job. She even held the cotton swab on her own for a bit (long enough to snap a picture that is). 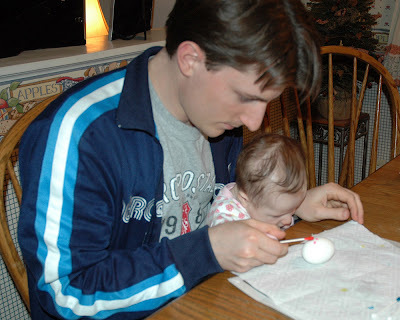 She seemed to really enjoy painting her egg. Perhaps we have an artist in the making. 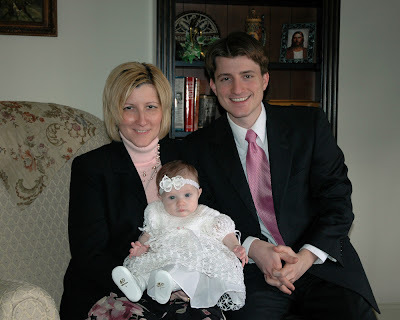 We attended church on Easter Sunday, during which Larry's dad was called as first counselor in the bishopric. 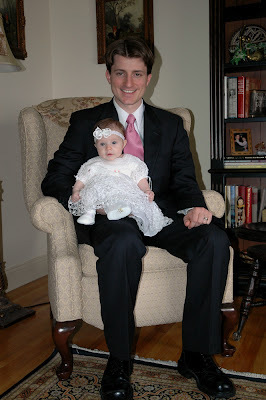 Ava was there to support her grandpa; looking lovely in her Easter dress, which we photographed her in after church. Here is Ava with her Grandma Furr and Larry. She was quite adept at getting her little fingers caught in the knitting of her dress. We finished the day off with a delicious ham, homemade apple pie, and a game of Pictionary. Granny O said: She looks just beautiful in her Easter finery. And she looks as if she could be a little Easter egg in her darling egg-coloring outfit. We are so happy to hear of all the "eggciting" things you are doing in Pennsylvania!